Dr. Alessandro Gronchi was born in Livorno, Italy. He received his primary and secondary school education in Milan and graduated from Liceo Classico G. Carducci with merit. He received his MD from Milan University (high honors) in 1992, and then completed his residency training in General Surgery c/o San Raffaele General Hospital in Milan. During his residency he served the Italian Ministry of Foreign Affairs for two years, working full time at Lacor Hospital in Gulu, Uganda. 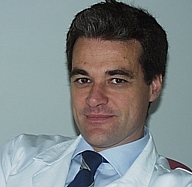 He then completed his training with a fellowship in Surgical Oncology at Istituto Nazionale Tumori in Milan in 1998. He joined the faculty in the Department of Surgery at Istituto Nazionale Tumori as attending surgeon in the Sarcoma Service in 1999. He visited Memorial Sloan-Kettering Cancer Center in New York in 2002. He has been chair of the Sarcoma Service at the Istituto Nazionale Tumori since 2001. Dr. Gronchi has a lifetime professional dedication to patient care and research in soft tissue sarcoma. His clinical practice focuses exclusively on this disease, and he has pursued clinical and research interests in soft tissue sarcoma during the entire time he has been a member of the Department of Surgery. He runs the Sarcoma database of Istituto Nazionale Tumori, which gathers clinical and biological information on over 5,000 patients affected by soft tissue sarcoma treated over the past three decades in Milan. He is involved in all institutional research activities on sarcoma, which include tyrosine kinases activation in different sarcoma entities as possible targets for therapy, different telomere mechanisms in sarcoma subtypes, molecular characterization of desmoid tumors, and mechanisms of resistance to therapy in GIST. He is the Principal Investigator of several Italian and international trials on sarcoma and GIST. Dr. Gronchi serves as chairman of the soft tissue sarcoma committee of the Italian Sarcoma Group (ISG),secretary of the EORTC Soft Tissue and Bone Sarcoma Group, and is a member of the Sarcoma Task Force of the European Society for Medical Oncology (ESMO), the Board of Directors of the Connective Tissue Oncology Society (CTOS), the International Committee of the Society of Surgical Oncology (SSO), and several other medical and scientific societies. Dr. Gronchi has authored more than 80 scientific publications, serves as Associate Editor of the Sarcoma Journal and as Sarcoma Section Editor of the Annals of Surgical Oncology. Copyright © 2012 - Liddy Shriver Sarcoma Initiative.